While a Porsche will probably never feature highly on my own personal wish-list, I will always have complete respect for nice examples like this 1970 914-6 Targa. In fact, calling it nice is doing it a disservice, as it really is an immaculate car. If you’ve always fancied the idea of Porsche ownership, then you will find this one located in Martinsville, New Jersey, and listed for sale here on eBay. Bidding has reached $64,389 at the time of writing, but the reserve hasn’t been met. However, judging by the text in the listing, it may not have far to go. 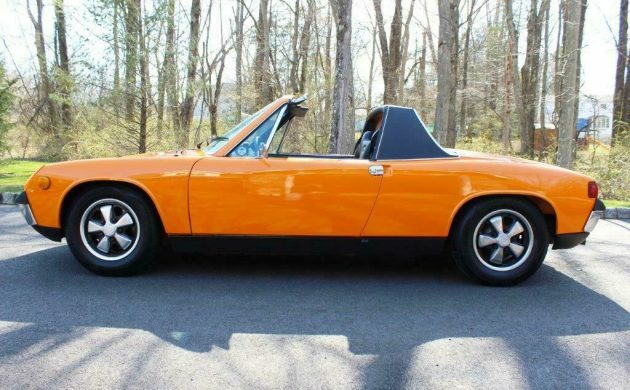 If you are looking for a 914, they probably don’t come a lot better than this one. The Signal Orange paint is virtually flawless, with not a chip or scratch to be seen anywhere. The chrome and trim are perfect, while the top is both original, and in perfect condition. The Porsche still wears all five of its original Fuchs wheels (including the spare), and these are also perfect. The owner says that the floors are original and rust-free, as are the known prone areas such as the battery tray and the longitudinals. The owner even supplies a number of photos with the rocker covers removed to show how clean the car is. 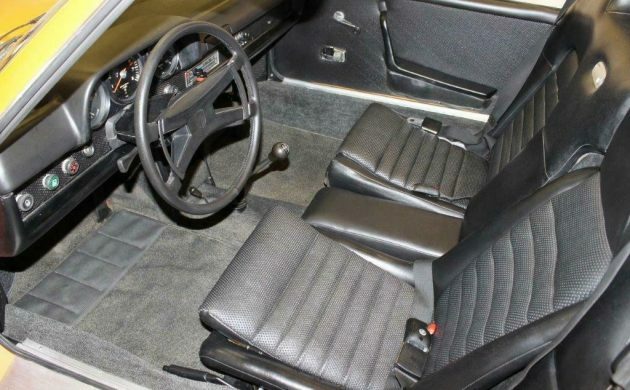 The interior of the Porsche is also completely original, with no aftermarket additions. The owner states that it is in near-perfect condition, with only a bit of fading of the carpet there to indicate the car’s age. In all honesty, I probably wouldn’t touch that, unless I could source OEM replacement carpet. The rest of the upholstery and the dash are just immaculate. Trust me, there is an engine hiding under there. It is the original, numbers-matching 1,991cc flat-six engine, matched to the original 5-speed manual transmission. With only 109hp on tap, it doesn’t appear to offer startling performance. However, given the fact that it is powering a car that weighs a mere 2,100lbs ensures that performance is more than adequate. As for this car, the news is all good. The car starts and runs perfectly, while the transmission is also very smooth. The owner appears to be a particularly meticulous enthusiast, as the car will come with a 1″ thick folder of receipts which comprise the cars maintenance and service history. Further to my earlier comment about potential rust in the battery tray, you can see it in this shot, and it looks perfect. As a person who is not a Porsche enthusiast, even I have to admit that this 914-6 Targa is an exceptionally nice car. There is not much that I can find to fault on it, and a low-slung car like this with a low center of gravity promises a fairly enjoyable driving experience when pointed at a piece of twisting road. One thing is for certain, and that is that with Summer on the way, there can’t be many better ways to experience those sunny Saturdays than from behind the wheel of this classic Porsche. I just can’t get past the styling, but make no mistake, this was a bad a$$ car. The 4 cyl, was pretty popular, but I never saw a 6 cylinder, and a lot of cars passed me while driving slow semi trucks, except at Road America, and they cleaned up on everybody. I’d have to think, the mid-engine 6 cylinder, with it’s extra weight, may compromise handling a bit ( I read that was a small problem) but to all those folks that bought those anemic 4 cylinders, all I can say, is you should have coughed up a bit more for the 6. You really missed the boat. Like the author says, I bet this is one fun car to drive fast. The majority of the four cylinder cars were sold after Porsche had quit selling the 914-6. I had a 2.0 liter 4 cylinder car, and it was great for its place and time. The 6 has a magnesium case, so minimal additional weight. Even if the 6 were totally cast iron and made half the power of the 4, it would still be the one to have, just for the sound. I had no idea that values for these had gotten so high! Granted it is the rare 6 cylinder but still… This one’s a beaut! 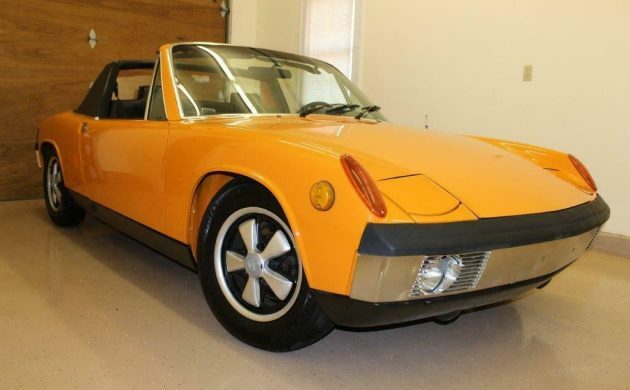 No way I’d cough up $65K-plus for this (I’m a cheapskate anyway), but the 914-6 was a sweet ride! The sound and handling made up for any styling deficiencies — not that there’s much to quibble about on such a simple design — and, like, say, driving an Alfa Milano, you can’t see the shape when you’re behind the wheel. I was lucky enough to spend some track time with a 914-6, and found absolutely nothing wrong with its dynamic behavior. If I had to complain about anything, it would have been the use of the two-liter engine and not a larger unit. The chassis could have dealt with more power easily. Howard A. The cars came with soft rear springs, small roll bar up front and none in the rear. All you had to do was put in proper roll bars and the rear spring upgrade available and the cars handled likes go-karts. 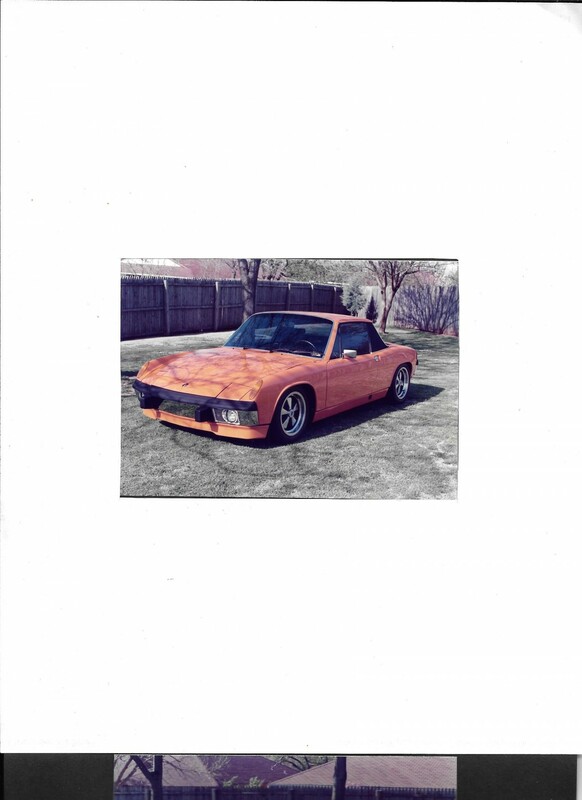 The car in the picture I built and sold years ago. New owner upgraded the engine to a modified 2.7 and brought it over for a first test drive. Nobody passed us that day. Fun! Did that 2.7 have over heating problems? 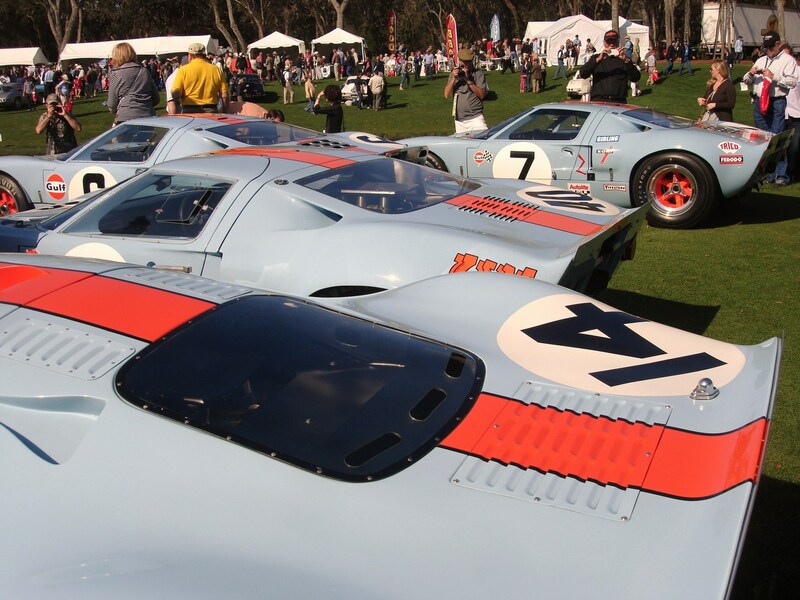 These “luft” boxes could get hot, especially out here in Kalifornia. I worked for a Porsche+Audi dealer in 1972 who sold a ton of 4-cyl. 914’s. They were a lot of fun to drive, even on LA’s freeways. When a 914-6 showed up one day for service everyone had to go take a gander at it as if it were some sort of mystical beast. I didn’t know it was 109hp but the cars were virtually go-karts with radios so a Briggs & Stratton could have powered them. had one of these many years ago, back when they could be had for a song. Unfortunately I learned all about rust from that poor thing. Glad they are finally appreciated, but knowing it’s unlikely i’ll ever afford another is a bitter bit of reality. Lovely car, and save for a 911 “S” i’d rather have this than any other 1970 Porsche. Oh boy Frank is at it again. I bought a car from this seller. He is NOT someone to be trusted. He is known on Ferrari forums and Porsche forums as someone to steer clear of. This looks like a very nice car, very tempting. There is a high probability something is going to be a problem with this transaction. He has his buyers (victims) deal with his wife who feigns ignorance. It’s a real s### show. Near perfect examples of these were selling right around $100k a few years ago. Care to give us a name or a link to the shenanigans so we can read all the dirty laundry about this seller? I’m going to talk my friend into converting his VW Karman Ghia into Porsche so we can sell it to these people. They would never know the difference. I wanted one of these so bad when I was in grade school. But at that price, I’ll still be wanting. or HATE them (styling).Doesn’t seem to have middle ground. until I checked on insurance – $1000/year. back when they were new.His license plate said “ITS A SIX”. For all the hatred for the 914,saying it wasn’t a true Porsche was disrespectful towards the owners. It might not been the greatest designs, but it worked perfectly.If you have never driven one of these, you owe it to yourself to put that drive on your bucket list. Afterwards, I’m positive it will forever change your mind about these little gems. That’s more Porsche than the not-missed 924 ever was. Killer ride, slot car, go cart on steroids, no more forgiving a car I ever drove felt better slamming into a corner. I worked for alpine Porsche Audi in Colorado Springs in the mid 70s, we sold a bunch of these to the airforce academy grads. You could toss it into a hard curve and always come out looking good. Well the 914 was a Volkswagen, not a Porsche. So for a Volkswagen it wasn’t really too bad. 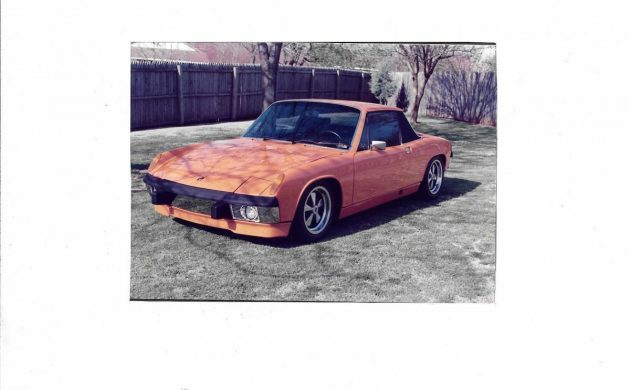 Yes I know the 914-6 had a Porsche engine. The most interesting part of the article was the lead sentence. Your lack of fondness for Porsche tells me you’re probably not interested in racing or engineering. And possibly don’t care for breathing air. lol. But the real curiosity comes as to what does figure highly. Hopefully it’s something other than a Chrysler. I’m guessing a Corvette. My First son was born in Sept 1974. I had just started working at a VW dealership here in town and business was so good we had a hard time getting a demo to take home. About the first Sunday that he was old enough to take outside, maybe a month old, the only car I could get was a 1970-71 914, probably a 4 cylinder. And you’re wondering how we took a month old baby for a ride to see grandma in a car with 2 seats? He laid flat in mom’s lap, of course. This was before any baby seat laws in this state. He rode quietly, and we had a nice visit. On the way back, we had to stop and get my wife an ice cream cone from the place just a block or so down the street from us. I think I had to go to the window, place the order and then take the cones back to the car. And you can guess what happened next. The look on his face, after she got the ice cream off of him was funny as hell but we both tried not to laugh. No photos of course. He’s heard the story many times and doesn’t think it’s as funny as we do. His son, age 10 this year, wondered why we didn’t take a picture with our phone. 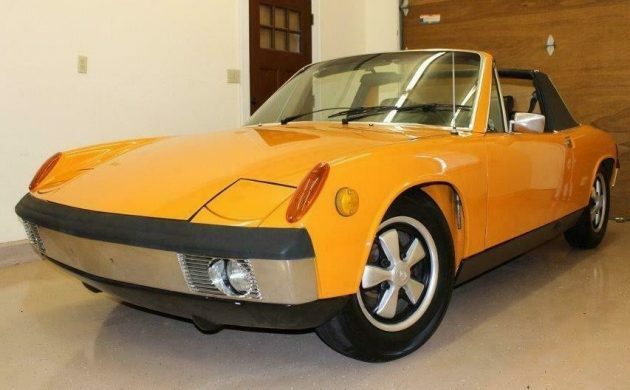 Ok, I had two 914’s, both 1971s, both were the common 1.7 motor (from the VW squareback), they were made by karman-gia (and had a builder plate inside to prove it. They were marketed as VW cars in Europe. The Porsche emblem was put on for the US market so as to appeal to the American’s vanity, that they owned a “Porsche”. The uneducated ones always mis-pronounced the name. It is NOT “PORSH”, IT WAS POR-SHA! Then you could be mistaken for a snob, or you could actually have been one. Most of us know that. With that being said, the 4 banger 914’s were such a kick to drive, the go-kart references you always hear to regards to handling were true. And put a set of 185/70 x 15 Pirelli CN36 HR rated tires (somewhat unneeded as your unmodified 914 was NEVER going to need those HR-rated 130 mph tires, much less 100 mph (but 100 mph could be done with proper tactics and road conditions) and some decent wheels over those factory anemic SR-rated 165 tires with those hip “styled” steel wheels (ugly), plus an anza exhaust, and your common 914 was really something… just avoid the freeway races. (funny those were the days when you had a 70 series profile “low profile” tires, man, you were really swinging it)! My 2000 WS6 firebird has 45 series tires on them 275/45 and they are not considered a big deal nowaways especially with “only” 17 inch wheels. With all of that said, I LOVED my 914’s… they could go 300+ on a tank of gas, hardly ever broke down and when they did could be fixed cheaply. 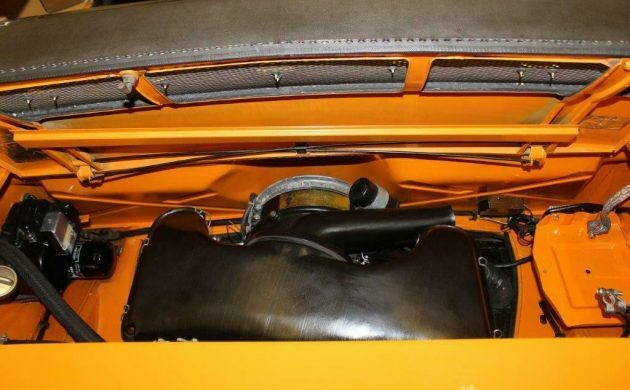 they did have a tendancy to overheat during the summer, as there was a rainguard under the engine access grill to keep the motor dry, however, it also kept the hot air from the motor from escaping straight up, the rainguard just blocked the hot air going out and the fresh air from coming in. the OBVIOUS solution was to simply take 5 minutes to remove the rainguard during the summer (since it rarely rains during the summer), and whahlaa, your overheating problems were just about over. Did not hurt to put an oil cooler on them also. Loved them, but never had a 914-6, which was a TRUE Porsche in every way. Too expensive to maintain and fix if things went wrong or broke. 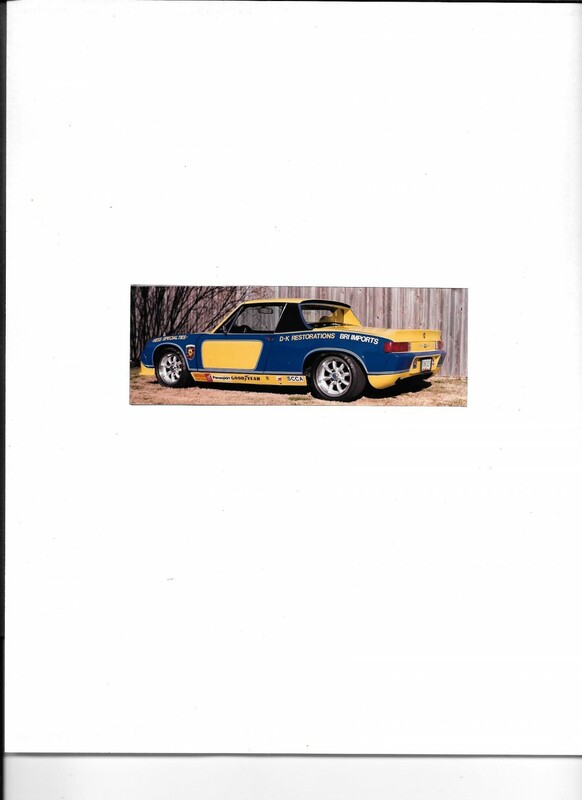 But I loved the 6 bangers anyways, and faked it a bit, at least with people who did not know these cars, by putting on a 914-6 emblem on the back, it fooled the unwashed masses and with my wide tires and ansa exhaust I could put on a heck of a bluff. However, one look by those who know could look at my 4-bolt wheels, even tho they were 911-looking aftermarkets, and know I was an imposter. All I can say, that as a 20 year old, cruising down on the I-5 grapevine in my little 914, I owned the road, but mostly only in mountain curves. I was king of the wasteland in my own mind. Never had a feeling like that since. Ah, the 914’s. I bought mine for $3,000 in 1976. I would given my teeth for a 914-6. Kurt… Car was born and bred in Oklahoma. Lot of heat but not a problem if the 911 oil cooler system is on the engines. 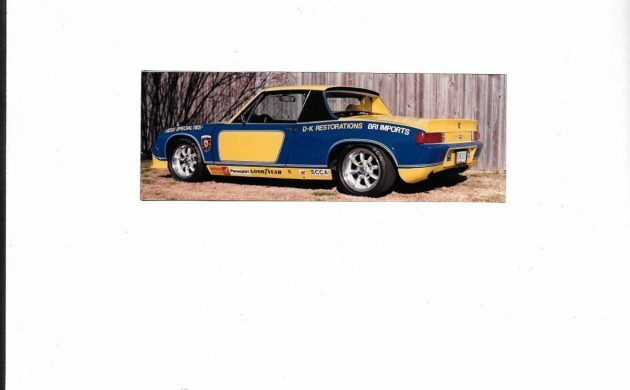 Another comment… I’m not a fan of the 914’s stock looks or powertrain. What I am a fan of is that they make great race cars. This car we built and raced for a customer. 2.5 four, 911 brakes, full spring, shock, sway bar, torsion bar modifications. Approximately 140 hp and and absolute blast to drive. And they always look better in race car form. In the mid 80’s I stored one of these at my house and exercised it regularly. One time my 75 year old mother came for a visit. I asked if she’d like a ride, and being pretty adventurous, of course she said yes. Once underway, I told her to hang on because I was going to turn onto side streets without slowing down. Making 90 degree turns at the speed limit is quite fun, but seeing the look on her face was the best part. Kurt… You should have seen the ’55 VW panel van we put a Covair 180 in as a support vehicle for our motorcycles. The 2 litre type 4 boxer VW engine was a great engine for anything VW. West coast folks were pulling over 200 hp out of some of them. By the way, I unintentionally did a wheel stand with the Covair VW van one night when the toll gate guy coming out of San Francisco charged me extra because I was in a “truck”. With all the oil on the ground coming out of the trucks as they came through I left the gate guy in the largest cloud of smoke I’ve ever seen. Corvairs are great but finding parts can be problematic. After reading the first sentence, I assume that Adam Clarke enjoys posting about all the old American cars show here and doesn’t enjoy posting about old European cars. Or maybe he just dislikes Porsches. That’s too bad. My first half dozen cars were all German makes including Borgward, BMW, Mercedes Benz, VW, Porshe, & Audi. I grew out of my preference for German cars sometime in the late 1970s. I’ve since had several cars by each of the American big three including Vipers and Corvettes. After driving more German cars and some Swedish, and Italian examples, Mercedes Benz, Porsche, and Ferrari are my favorites, but I do still drive a big diesel Ram. I see a lot of American cars and especially Corvettes on this daily email. That’s too bad. 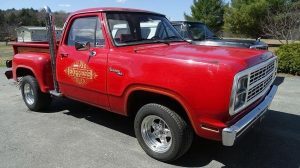 There are a lot of interesting collector cars and trucks out there from many different worldwide manufacturers. Like Adam Clarke’s dislike for Porsches, I’m tired of seeing so many Corvettes here.